Details at the end of this post on how to enter to win a surprise gift bag from the author. We also have a link to purchase A Reel Catch from Amazon, and an indie bookstore where a portion of the sale goes to help support KRL. 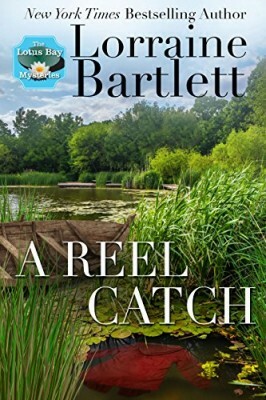 Tori Cannon returned to rural Western New York’s Lotus Bay to help her grandfather after the death of his wife, but a winning lottery ticket sends him off to Florida with his fiancé and gifting Tori with a home and his Cannon Bait and Tackle shop. Long-term plans include re-opening the Lotus Lodge, but without additional financing that won’t happen any time in the future. So it seems oddly fortuitous that Tori suddenly has two offers willing to be her backers, although both aren’t exactly generous with the share of the profits and designate her as the silent partner. Money concerns almost make discovering a body in the marshy water incidental, but that’s before he’s identified as having been declared missing and dead twenty-five years ago. Before he was Mark Charles, Charlie Marks was the high school friend of locals who continue to run The Bay Bar frequented by Tori and her closest friends. It’s going to be a little uncomfortable questioning the co-owner though, as her guest referral led to the trashing and thousands of dollars in damage to Kathy Grant’s Swans Nest Inn. Tori and contractor Anissa Jackson had intended to be Kathy’s first guests as a trial run before opening the Bed and Breakfast, but now all the women will be too busy attempting to do repairs before the actual opening day. Tori’s not about to let her BFF down, though, so she will somehow squeeze in painting and wallpapering duties while substitute teaching and researching the life of the man with unimaginative pseudonyms. The bonds of friendship between Tori, Kathy, and Anissa are the focus of this second in the series, and even without having read the first, readers will feel the love and loyalty they have for one another. Narratives shift viewpoints between Kathy and Tori, but the latter takes center stage as she struggles to keep her business dreams alive. A greedy cousin reinforces why Tori and her grandfather have such a close bond, even if there is an underlying tension of just who bought that actual winning lottery ticket. The unconditional love and affection between the three women is enviable and a delight, proving that their relationships will outlast any they have with men. The humor flows naturally and continuously, but the banter never overshadows the genuine heartfelt moments or the timely topics of the #Metoo Movement. The setting truly comes alive with descriptions of local watering holes and local home renovations, but the side characters and these three extraordinary women are the stars. To enter to win a surprise gift bag from the author, simply email KRL at krlcontests@gmail[dot]com by replacing the [dot] with a period, and with the subject line “reel,” or comment on this article. A winner will be chosen September 22, 2018. U.S. residents only. If entering via email please include your mailing address (so if you win we can get the book sent right out to you), and if via comment please include your email address. You can read our privacy statement here if you like. I enjoyed the first book & can’t wait to read this one. Thanks for the giveaway. No matter what name or what genre – this author is a talented writer. She creates lovely mysteries and add touches of humor. Love her books. I am excited to read this next in the series! This is a new series to me, although I’ve enjoyed other books by her. forward to trying this series. A favorite author with a series I haven’t read – yet!